Front has a story that any budding startup would envy. Highlights from the past four years include scaling to 100 employees, acquiring more than 4,000 customers, raising almost $80 million in funding and closing the books on its first acquisition. 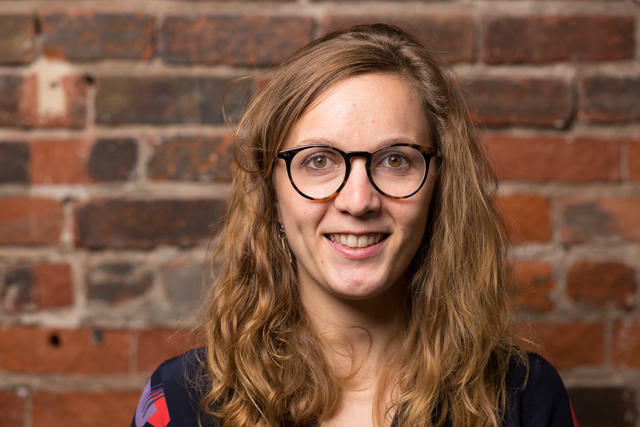 But as co-founder and CEO Mathilde Collin tells it, the workplace communication tool’s meteoric rise can’t be traced back to an incredible founding vision from their early Y Combinator days. In fact, Collin was unsure where the product was heading at the time and had serious doubts about whether the company would take off. According to Collin, the startup’s success instead took root thanks to a single trait: discipline. This is an answer we’ve heard before — after all, most leaders wax over the stories of their careers with a thick coat of grit and determination. And whether it takes the form of an inspirational quote splashed across a striking stock photo or an encouraging blog post about the startup grind, discipline is always cast as a recurring character when entrepreneurs talk about success. But while the discussion around this quality is heavy on colorful mandates, it’s also often lacking in detail and depth. Very few go beyond platitudes about working hard to move into more nitty-gritty tactics for bringing an intense discipline to every facet of the company building process. Collin, however, is a rare exception. Her quiet focus and obsession with efficiency has been the propellor beneath the surface, helping to power Front’s impressive trajectory. From her pristine email templates and clockwork communication habits to her insanely fast fundraise process and carefully crafted calendar, discipline is the current that runs through all aspects of this founder's life. In this exclusive interview, Collin dives deeper to put tactical teeth on an entrepreneurial trope, sharing why a founder’s discipline matters more than vision. She describes her approach to communication, time management, fundraising and team building, unveiling impactful practices and sharing the actual emails she relies on to stay on track. Many early-stage teams pour hundreds of hours into ensuring that the product roadmap and company mission are as crisp as possible. Painting a picture of potential is a way to put a stake in the ground — and it’s often a helpful tactic for papering over initial shortcomings. But that’s not how Front went out into the world. As a founder, I’d choose discipline over some grand vision any day of the week. “I’m sure many will disagree with me on this. But the driving force behind Front’s success is that we’ve been incredibly disciplined at every point along our journey. And this isn’t to say that we were lacking in ambition,” says Collin. “It’s to point out that the pressure founders put on themselves to have a far-reaching plan isn’t always helpful or realistic — and it’s certainly not a predictor of future success. The vision I pitched in our Series B fundraise was totally different from what we presented back at Demo Day. What mattered more was that we were determined to turn this kernel of an idea into a real company through sheer will,” she says. To unpack this fundamental question, Collin dissects this essential attribute further: “At a high-level, discipline is focusing on just a handful of things, which is incredibly challenging because you’ve got so much to do and you’re pulled in so many directions — everything seems important. But discipline comes down to focusing on the right thing, which means you need to be crystal clear on what success looks like and how to measure it,” she says. Making progress: What metrics are you using in order to see if the company is succeeding? How are you orienting your entire team around them? How frequently — and consistently — are you communicating updates? Managing time: Does your calendar actually reflect the priorities from above every single week? Is there an activity you aren’t spending enough time on? Do you have the discipline to disconnect and step away? Fundraising: How are you managing your investors? Are you sending frequent updates on your progress, tightening your pitch and proactively building relationships? Team building: What are you doing to consistently create a great work environment? How are you making sure that every hire meets your standards? If you’re not disciplined with managing your time and religiously tracking your company’s progress, it’s going to be very tough to succeed. As fledgling startups struggle to find their footing, tackling high visibility metrics becomes the main focus. But in Collin’s experience, simply pursuing progress isn’t enough — an extra dose of discipline around communication provides the accountability that makes those goals more likely to materialize. 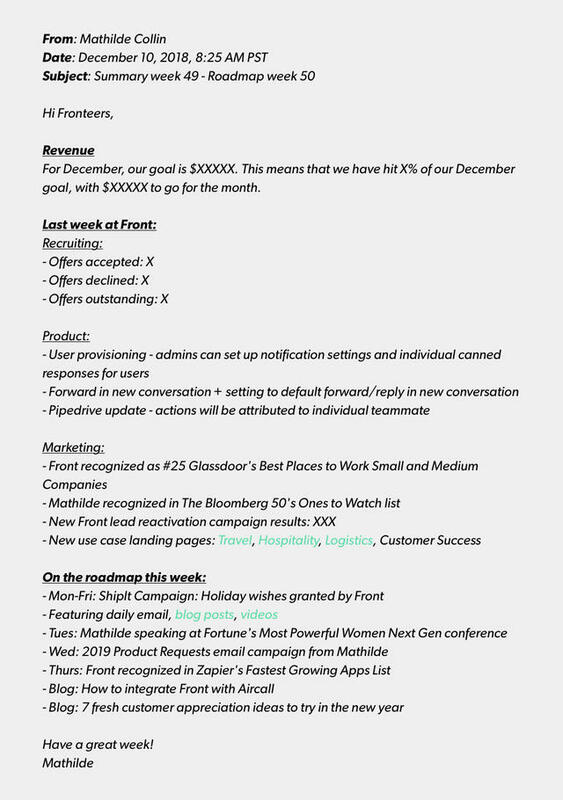 For Collin, that discipline lies in the three carefully constructed emails she has sent with an almost frightening regularity since Front’s earliest days: a weekly update to the entire company, a note to her direct reports and a monthly update to her investors. Read on for a closer look at how she crafts them and why they’ve been critical to Front’s results. As with most startups, Front’s early days were marked by an obsession with revenue. “We had no excuse if those numbers weren’t trending upwards. 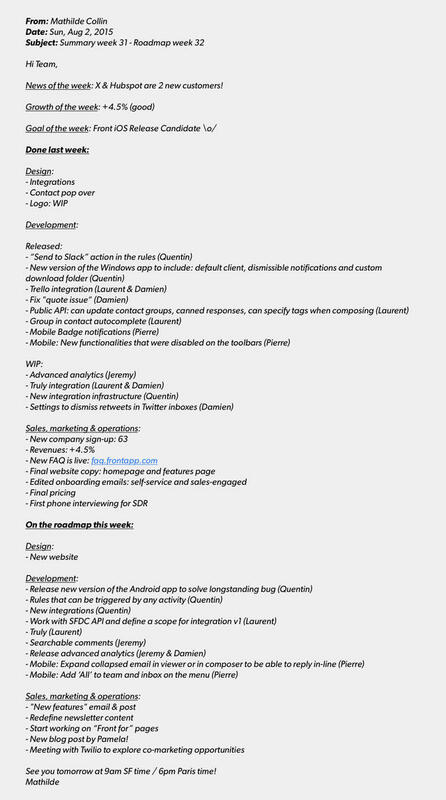 So I started sending a daily email to the team to bring that metric front and center. It explained how much revenue we added yesterday, what we did well and what didn't go so well,” says Collin. “I soon changed it to a weekly email as that was a better cadence, but ever since I’ve sent this email every single week to our entire company. It always has the same structure and is sent around the same time. And I haven’t missed a single one in the past four years,” she says. SENT FOLDER: Below you'll find an early example of the weekly emails Collin sends to the Front team. 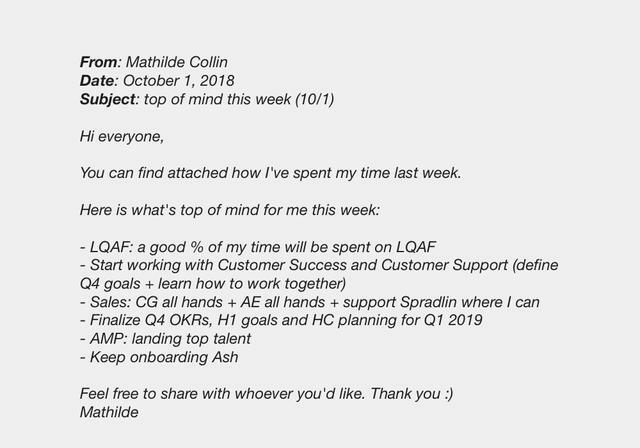 SENT FOLDER: Here’s a more recent, real-world (and lightly scrubbed) example of how Collin's weekly email template has evolved over time as Front has scaled. Concentrate on a single metric. If it’s not improving, resist the easy comfort of letting up and focusing on something else. Stay the course. As another exercise in accountability, a different email flies out of Collin’s inbox at 10am sharp every Monday morning: a note to her direct reports. “I quickly run through all of my goals for the week. It’s not about telling your reports every single thing you’re going to do. Rather it's a chance to share what’s top-of-mind for you, which of course should be top-of-mind for them. More generally, it’s helpful to know how managers spend their time — often it’s a more of a black box instead. That’s also why I’ve made my calendar public and shared a deck that explains what I do all day as CEO of Front,” she says. This email habit also sets an example. “If I start to slip or if my weeks don’t ladder up to those big goals we’re focusing on, that sends the wrong message,” says Collin. SENT FOLDER: Below is an example of Collin’s direct report email in action. 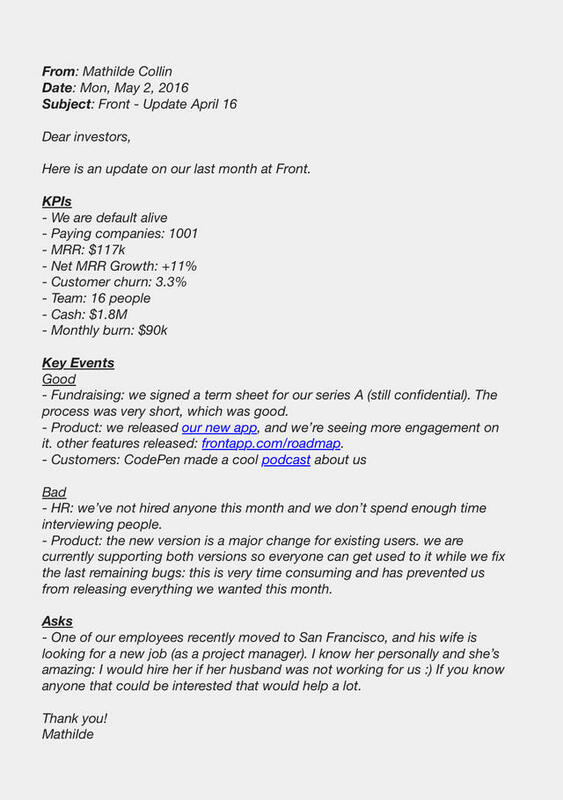 Another one of Collin’s favorite tricks for bringing discipline to her communication is the update email she sends to Front’s investors. “I sent the same note every month for years, and only changed to quarterly after our Series B,” she says. SENT FOLDER: Below you'll find an example of what Collin’s note to investors looks like in practice. Collin’s faith in the power of demonstrating your focus to investors has only increased now that she’s on the other side of the table. “Since I’ve started angel investing, I feel even more strongly about this practice. After a founder sends me two or three update emails, I can immediately get a sense for whether or not that company will succeed,” she says. “Some send an email and then you don’t hear from them again for four months. Others use different formats or metrics every time. Or they say that revenue is the top priority in one meeting and then say they’re focusing on engagement and redesigning the app in the next. That’s not an update, that’s an excuse. If revenue isn’t where it needs to be, admit that you have an issue to your investors, your team, and above all yourself so you can start getting back on track,” she says. Regular communication is unbelievably powerful. If you can’t send your investors focused and consistent updates, you’ll probably be one of those startups that doesn’t make it. Asking Collin about how she manages her time prompts a frank confession: “I am really crazy when it comes to my calendar. I’m hypervigilant about making sure that I spend time on the right things,” she says. This assertion is backed up by a quick glance at her schedule — every slot is filled and every minute is accounted for. “If I don’t always know what I'm doing, then I get sucked into checking my emails or answering questions instead of focusing on what I said was most important at the beginning of the week,” says Collin. But that doesn’t mean her calendar is brimming with meetings. In the debate between a maker's and manager's schedule, Collin straddles the line down the middle. 1) Block and tackle: create a window for email and opt out of notifications. 2) Step back and clear your head. 3) Set a date with yourself on Friday to organize the next week. Collin finds this exercise serves as another fail-safe to make sure she’s allocating enough time to the right things. “This also dovetails with the weekly email I send to my direct reports. If I tell them that my goal for the week is to decide what the new sales organization will look like, then I better have a few personal working sessions and key meetings dedicated to that,” she says. 4) Analyze your time to match intention with reality. 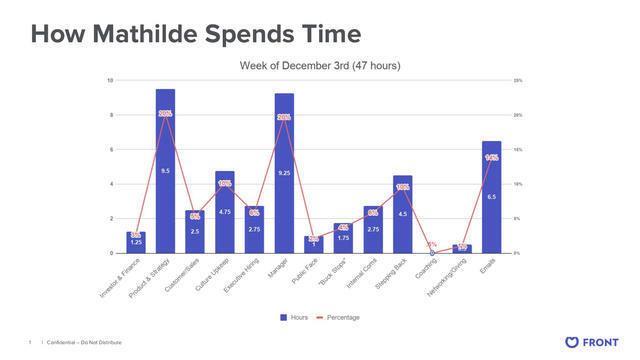 Among her Twitter followers, Collin is known for occasionally sharing a graph of how she spends her time. 5) Take the time to write it down. In addition to sharing a breakdown of how she spends her days, Collin also generously shares a window into her journey as a founder by writing articles with very tactical details to provide insights for founders. And it comes as no surprise that the writing time required to produce these pieces is meticulously scheduled. While her email habits and time management tactics are impressive, Collin is perhaps best known in the tech world for her fundraising chops. She netted three term sheets for her Series A round in a mere 10 days and timeboxed her Series B fundraising process to just one week, walking away with 10 term sheets. More impressive still is her generous commitment to sharing her best practices with others. Collin put both her Series A and Series B decks online for the world to see, highlighting strong slides as well as feedback she received. 1) Develop relationships before you need them, but don’t be afraid to hold back. While these fast fundraising cycles may seem to be the stuff of startup kismet, Collin is quick to point out that she was only able to raise so quickly because she put in the legwork upfront. In her eyes, these rounds weren’t the sum of five to ten days of pitching, but rather the culmination of four years of careful chess moves. Early-stage founders looking to replicate this tactic should note that it’s about quality, not quantity. “I was focused on about five partners. Going really deep with just one investor puts all your eggs in one basket, but cultivating 20 relationships would be distracting,” says Collin. These ongoing conversations with investors should move beyond shop talk. “Once you're in a fundraising process, it all happens in a flash. So for me, these meetings weren’t simply a report on how Front was doing, but rather a chance to get to know the partner. I asked them what they liked and didn’t like about investing or what they did outside of work,” she says. If you’re focused on building relationships with investors well before you need them, the fundraising flywheel will spin much faster. 2) Raise or don’t raise — don’t let it drag. As with most things, when it comes to fundraising, timing is everything. But deciding when to pull the trigger requires navigating that tricky space between art and science. Collin also leaned on open lines of communications with investors to speed along her Series B round. “One of the partners I was talking to casually mentioned that he’d invest in our next round. I took him seriously — and I used that one term sheet as leverage to compress the timeline for everyone else. The discipline it took to sink time into that relationship and then full-on commit to raising is what put me in a position to set the terms and move quickly,” she says. Putting speed aside, most founders grapple with the broader problem of figuring out when to raise. Collin identifies the three factors she considers: feeling good about the business, reaching a marker set in the previous round and requiring additional resources to attain a new ambitious goal. Going after a new ambitious goal. “Just before we did our Series A, we had three great quarters in a row. Around that same time, I was speaking to a branding agency, but it was pretty expensive. That set off a lightbulb in my head that I could invest more in the long-term if I had more money,” she says. Your metrics won’t suddenly snap into place ahead of your next round — and even if they do, that might not be enough. Your state of mind is incredibly important, so look for the moments that make you excited and capitalize on them. 3) Remember that it will be stressful no matter what — and prepare for the sting. Even though Front had a legendary Series B round, Collin is quick to point out that it was far from painless. “I’m always getting comments from people about how they are so envious of our quick rounds and how easy it must have been. But every would-be founder needs to know that it’s always going to be stressful. Even though we had one of the smoothest fundraises imaginable, it was still incredibly tough,” she says. 4) Bring discipline to your deck by focusing on the story. As for the pitch decks that earned all of those terms sheets (and racked up millions of views on the internet afterwards), Collin shares how they came together — and why discipline was essential. “There's a temptation to stuff every metric you can find in the deck. But you have to be really disciplined in the narrative you present to investors in order to boost your odds. Think of the pitch as a story waiting to be told, not a set of slides to be strung together. I’m not here to report what Front did in the past four years, I’m here to paint a picture,” she says. Think of the story you want to tell in your pitch and write it out — without opening Keynote. Then choose the data that helps you fill in the brushstrokes of that bigger story arc. 5) Do diligence on your investors. For founders looking to follow in her fundraising footsteps, Collin offers a final tip. “VCs dig into you and your company before investing, but remember that diligence is a two-way street. You can always get rid of employees, but your investors stick. That’s why when we were considering Sequoia’s Bryan Schreier for our Series B, I talked to the founder of almost every company he was on the board of,” she says. Share some examples of when they've been caring. What types of things did they typically challenge you on? Was it helpful? Tell me about a time when they disappointed you. Did you feel like you could have an open discussion and give feedback? Looking back on the early days of your working relationship, how would you manage or interact with them differently, knowing what you know now? Collin brings the same regularity and intention to her internal team building efforts — and has the results to prove it. Front has a 5-star Glassdoor rating, an internal NPS of 87, while only a few people have voluntarily left the company in the past four years. “This high employee engagement is a result of the transparency we’ve cultivated and the commitment we have to making people feel like they have an impact,” says Collin. 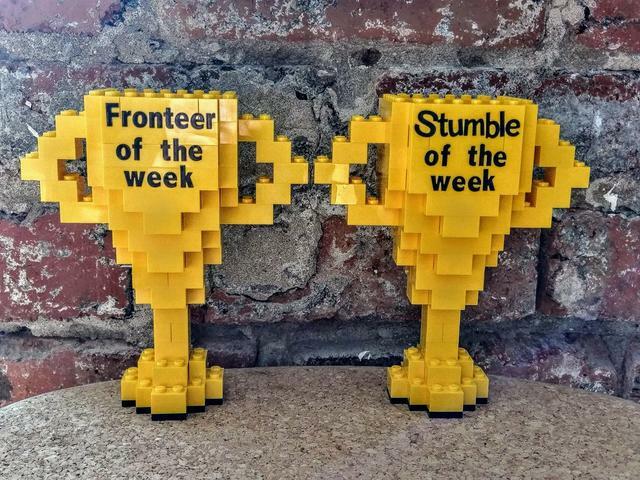 Outside of the weekly email connecting everyone to the main metric they’re working towards, Front has smaller initiatives to highlight impact, such as using ‘Fronteer of the Week’ and ‘Stumble of the Week’ as opportunities to share wins and learnings (and award trophies crafted out of legos). The Lego trophies awarded to a member of the Front team each week. The startup also embraces fun (and regularly scheduled) events, such as board game nights every month or the musicals that the entire Front team puts on once a year. The most recent productions included stagings of ‘Les Mis’ (with Collin of course taking on the role of Cosette) and a Disney medley. “It’s a programmatic way to give people a chance to be very vulnerable. Whether they're dancing, singing, narrating or playing an instrument, it brings the team together,” Collin says. “Overall, we're very disciplined, with the same programs at the same weekly, monthly or annual cadence. Bring regularity to your team touchpoints to make sure they aren’t a one-off initiative from HR or a tradition that dies out — create something employees can count on,” she says. However, Collin doesn’t place too much weight on Front’s approach to cultural events. “Many startups focus so much of their team building efforts on events or offsites and start to lose sight of the core of their culture: hiring people that align with your values,” she says. Events aren't culture. They’re something you do to build it, but they aren’t an end themselves. Be disciplined in who you hire and how you live out your values — that’s the culture. When it comes to getting a startup off the ground, time is the most precious resource and momentum is the objective. That’s why a founder’s discipline and willingness to dig in can be more determinative than the ability to project a sweeping vision for the company. Reach goals by communicating more consistently: Concentrate on moving a single metric by regularly communicating with your team, direct reports and investors. To provide an additional layer of accountability, templatize your most important messages and never miss an update. Manage your time to find focus: Develop the calendar hygiene to match work to stated priorities by reviewing your schedule for the upcoming week every Friday and analyzing how you actually spent your time. Create the space to step back and reflect by blocking off dedicated windows for checking email, writing and meditating. Fundraise faster: Condense your fundraising timeline by proactively building relationships with and doing careful diligence on investors. Assess if it’s the “right” time to raise by considering your state of mind and looking ahead to milestones you want to hit. Make sure your pitch is a story, not a set of data points. Build better teams: Boost retention and engagement by bringing regularity to cultural programs. But remember that events aren’t the culture, people are. Don’t hire someone if you don’t want to have 10 times as many people like them on the team. 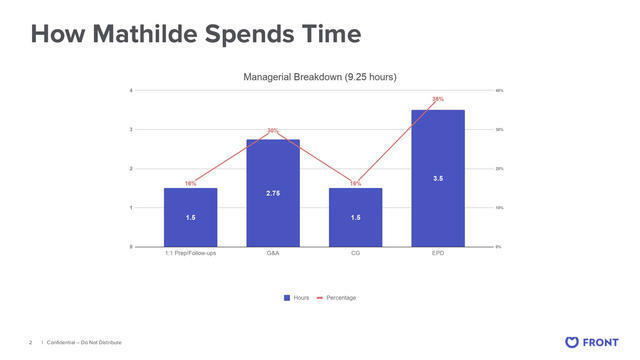 Email and time analysis examples courtesy of Mathilde Collin. Photography by Brandon Smith.